Dermal fillers are used for a variety of facial aging concerns. They are most commonly used to add volume and smooth out deep lines and wrinkles from the nose to the mouth. Some dermal fillers can plump thin lips or fill in vertical lines that surround the edges of the mouth. Many can be used to augment your cheeks, fill out lines under the eyes, and increase overall volume in the face. Generally, the effect of dermal fillers can last from six months to two years. They are made from a synthetic material that is injected directly into the skin. Dermal fillers are not to be confused with Botox fillers. Botox is usually injected around the forehead or around the eyes to stop the movement of your facial muscles. Dermal fillers allow you to maintain muscle movement while still plumping and smoothing your skin. Many patients have found success when combing both Botox and dermal fillers for a youthful appearance. Not all dermal fillers are created equal. Every brand has different physicochemical properties that work best in specific areas of the face. Juvederm, Voluma, Restylane, and Belotero contain hyaluronic acid, Radiesse contains calcium hydroxyapatite, and Sculptra contains poly L-lactic acid. With so many types and brands on the market, it can be difficult to decide which dermal filler is right for you. These fillers are made out of a molecule that is found in your skin naturally. They are generally safe to use and cause little to no side effects. These fillers work best when injected into the cheeks, lips, nasolabial folds, eyelids, eyebrows or forehead lines for volume. These fillers absorb water which results in plumping up the skin. They are widely used to treat areas with thinner skin such as around the nose and mouth. You would choose from one of these products if you are looking to plump your lips. Typically, results with one of these fillers can last from 6 months to a year. The plus-side to hyaluronic acid injections is that they can be reversed if you are unhappy with the results. Your physician can inject the area with an enzyme called hyaluronidase to reverse the results. Voluma is less hydrophilic and does not attract very much water. From the Juvederm family, these injections result in little to no swelling or redness. Voluma is ideal for patient’s looking to lift the mid-face area resulting in a more youthful appearance. Belotero has an extensive line of products to help fill in and smooth wrinkles. When used as a lip filler, it provides natural-looking outcomes. This dermal filler works by stimulating your body to form new collagen. Radiesse has shown excellent lifting results when injected deep into the bone. It can also be used to rejuvenate and smooth wrinkles in the hands. Many patients use Radiesse for volumizing the cheekbones. It is a thicker filler and should only be used on individuals with thick skin. Radiesse can be used for a variety of facial fixes including adding volume to the cheeks or smoothing severe lines in the nasolabial folds. The results can last for up to two years in some patients. Restylane was the first dermal filler on the market containing hyaluronic acid. It is most commonly used to correct folds and facial wrinkles or to add volume to the lips. Sculptra works gradually over time and requires a series of treatments for best results. Generally, you would space out your series of injections 4 weeks apart. This filler helps jump-start the formation of new collagen in your skin. Sculptra is one of the most powerful dermal fillers used to treat sunken or hollow areas of the face. Many patients use Sculptra during a liquid facelift procedure. Sculptra provides a very natural look that can last up to two years. It is approved by the FDA and has been used for 20 years. It is made from the poly-L-lactic acid that is naturally absorbed by the body. If you are unsure about taking the next step, Dr. Andres Bustillo can help ease your concerns. He is a board-certified plastic surgeon that has been performing facial procedures for over ten years. He uses only the most advanced techniques that are available to the industry. His areas of expertise are rhinoplasty and revision rhinoplasty surgery, deep plane facelifts, minimal incision neck lift, and blepharoplasty. 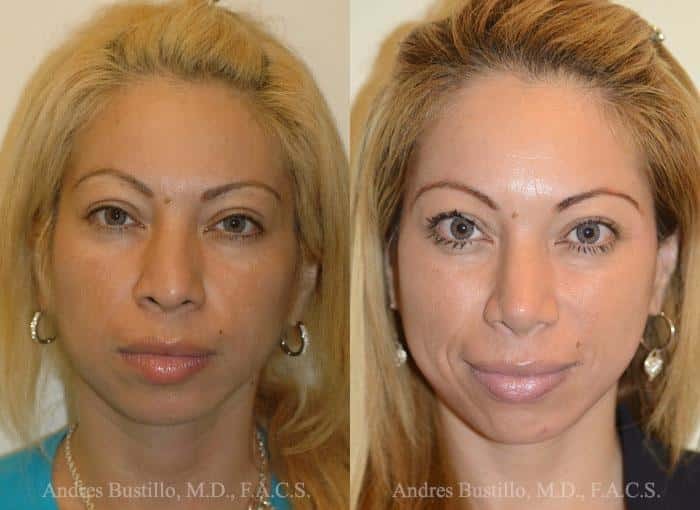 Dr. Bustillo is an honest surgeon who wants to give you the most natural looking results in the shortest amount of recovery time. While based in Miami, Florida patients seek Dr. Bustillo’s expertise from all over the world. Twenty-five percent of his patients come from Europe, South America, and the Caribbean. During your initial consultation, Dr. Bustillo will review your medical history and evaluate the area you wish to have treated. Even though dermal fillers have little to no side effects, certain allergies or existing skin conditions can cause adverse reactions. It is recommended that you don’t take aspirin, naproxen, or ibuprofen as they will increase your risk of bruising. Dr. Bustillo can offer a topical anesthetic to numb the injected area for your comfort. After your dermal filler treatment, you should be able to go back to your normal activities the same day. This article was written by, Dr. Andres Bustillo, MD FACS is a board certified fellowship trained facial plastic and reconstructive surgeon. Very fruitful post thanks for such useful information.